Those are earthly words, but which like heavenly things are purer than tried silver, better than gold, of greater value than precious stones. This is the treasure which during five thousand years the heavens sought upon earth, and which one from before the heavenly throne was sent to reveal. What does this mean? 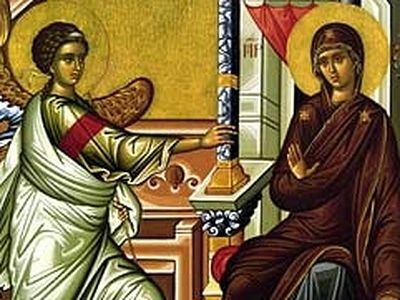 What means it that the incarnation of the Son of God is preceded by annunciation from heaven, and that it is not only proclaimed by the sovereign will of the Lord, but also awaits the assent of His handmaid. Is then the Almighty powerless to act without preparations or without awaiting assent? Wherefore does heaven so earnestly look for these earthly words, “Behold the handmaid of the Lord, be it unto me according to thy word”? They were necessary as well for the dignity of the Mother of the Lord, as for the very act of the incarnation of God the Word. None will doubt that in order to become the chosen Mother of the Lord, there was required in her, who should be elected, the highest merit attainable upon earth. And in what can the merit of a free and reasonable being consist, if not in the pure and elevated aspirations of the mind, and in the free action of the will? They were necessary, that the dignity of the Mother of the Lord might be founded, confirmed, and revealed, for our joy and edification, in the Virgin Mary. Her trouble at the glorious salutation of the Archangel was the feeling of a deeply humble soul. Her restraining this trouble in silent meditation was a token of the wisdom, firmness, and tranquil exaltation of the soul. In the question, “How shall this be, seeing I know not a man?” there was revealed a constant love for the chastity of virginity. At length, in the final exclamation, “Behold the handmaid of the Lord, be it unto me according to thy word”, there was expressed the obedience of faith. If, as the Apostle teaches, “Christ may dwell in hearts by faith” (Eph. 3:17), being already near to humanity, and in communication with it by His incarnation; then how much stronger and more perfect must have been the faith required of the Virgin Mary in order that the Son of God might by His incarnation take His abode in her, while humanity was yet alienated through sin from the inaccessible glory of His Godhead. And such faith was found in Mary, rendering pure and perfect obedience accessible to her; unto a mysterious calling, an undoubting obedience; unto a calling unparalleled in its exaltation, an obedience without exultation. And this obedience bent her soul under the overshadowing of the Holy Ghost, blended her will with that of God, opened her heart to the power of the Highest; and the eternal Light came down and kindled in her a life, new, not for earth alone, but for heaven also, the heavenly in the earthly life, the eternal in the temporal, the divine in the human, the quickening life in the mortal life. “And the Word was made flesh, and dwelt among us” (John 1:14). “Thy works are wonderful, O Lord! Thy mysteries are wonderful, O Mother of God!” Who hears thy low breathings in thy closet of solitary prayer? Who foresees what marvelous events thy brief words carry in them? Is the world aware of this moment when its whole destiny is changed, in which the relations between heaven and earth are transformed? Does Rome, dreaming of universal sovereignty, know that in one of her remotest provinces, a certain king’s daughter, calling herself “the handmaid of the Lord”, has just uttered the sentence which prepares unto the world a new, a better, a higher Sovereign, and unto Rome the destruction of her proud and arbitrary empire. Have the renowned oracles of paganism divined that from the lips of an unknown Virgin there has issued the prediction which shall silence them, overthrow the idols and their temples, put an end to the bloody sacrifices, and exterminate the sanguinary sacrificers? Did the wise men of this world conceive the thought that at the voice of a Hebrew maiden there should come down from heaven the Wisdom until then unknown, the Wisdom which shall confound the wisdom of the wise, and put to shame the understanding of the learned, but shall reveal unto infants mysteries unfathomable to the wise? But what do I say? Jerusalem and the tribes of Israel who have known and preserved from their ancestors the promise of God concerning the Great Liberator and Peacemaker, and who “instantly serving God day and night, hope to come” (Acts 26:7) to its fulfillment—have they attained the knowledge, that having traversed the vast domain of promise, on this day or on this night, they have suddenly attained the limits of its fulfillment, and that this limit was found in Nazareth? Do the Scribes, who have so many times read in the Book of Isaiah, “Behold, a Virgin shall be with child, and shall bring forth a Son, and they shall call His name Emmanuel” (Matt. 1:23), and have almost as often wondered at this,—do they think that the Virgin foreseen by the prophet, has already understood this prophecy, and is preparing herself to fulfill it? 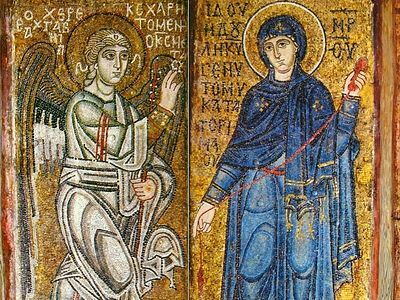 Does, at least, the just man Joseph, who is no longer a stranger to the mystery of the Virgin, having espoused her, that she might remain a virgin—does he know that immediately after this she was espoused to the Holy Ghost, and became the Mother of the Lord? 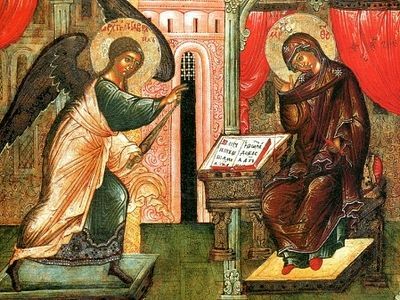 Throughout the whole world none but one knew of the Annunciation of the Archangel, at the time of its taking place, and yet it was destined to be proclaimed unto the whole world on its accomplishment. And on the first hearing the seemingly simple words of the Annunciation of Mary, “Behold the handmaid of the Lord, be it unto me according to thy word”, who would have been able to fathom their whole import, or feel their whole power? Their import is known but to the depth of the wisdom of God embracing time and eternity; their power is one with the might of the Highest, and shall transfigure earth and fill heaven. Humble yourselves, ye prying investigators. Wonder and rejoice, ye lowly contemplators. Throw down, O proud intellect, the fragile weapons of willful sophistry, and learn to love the free captivity of faith! And thou, soul, who in a godly manner seekest thy salvation, be taught by the word and example of the most blessed Virgin to what lofty heights we are led, how much is achieved, how perfectly God is pleased by this humble and seemingly obscure virtue,—obedience of faith: that obedience in its high, substantial, spiritual sense, means the subjection of the human will, created and dependent, unto the divine will, creating and sovereign. From this we may at once perceive the duty, efficacy, and importance of that obedience. Is it for the creature to rise against its Creator? Dares the earth-born slave rebel against his heavenly Lord? A mind which is not thoroughly darkened, and a heart not entirely hardened, will combine to repel this absurd inconsistency. Mind and heart accord in pronouncing obedience the duty of the human towards the Divine will. The Divine will is infallible. Consequently obedience unto the will of God must preserve or liberate man from sin and error. The Divine will is most good. Therefore obedience to the will of God must lead man to everything that is good. The creature without its Creator is nothing. It exists but through the power of its Creator. What then will become of the will of man if it do not adhere unto the Divine will through obedience, if it fall off from it by disobedience? There was a time when the first man was happy. Why? Because he followed the perfect will of God. How did he fall from the height of his happiness? His will fell off from the Divine will, and sank into sensual desire. Disobedience, sin, death—these are the links of one chain; he who lays hold of the first link draws upon himself the last of them—and, oh, that it were ever but upon himself alone! But we see the contrary; “for by one man’s disobedience many were made sinners” (Rom. 5:19). “Wherefore, as by one man sin entered into the world, and death by sin; and so death passed upon all men” (Rom. 5:12). Is it then necessary to heal hapless humanity of a universal deadly disease? It is easy to guess, that the most efficacious remedy will consist in that quality the loss of which was the origin of that disease, that is, obedience. And it is with this corrective that the Great Physician came down upon earth. See, how being Himself whole, He prepares in His own person the remedy for diseased humanity—by obedience. “He humbled Himself, and became obedient unto death, even the death of the cross” (Phil. 2:8). “By the obedience of one shall many be made righteous” (Rom. 5:19). “Though he were a Son, yet learned He obedience by the things which He suffered; and being made perfect, He became the author of eternal salvation unto all them that obey Him” (Heb. 5:8,9). There is an obedience of love, an obedience of fear, an obedience of faith. Man lived in the beginning as on sweet food, on the obedience of love unto the Merciful and Perfect God. But afterwards, when he had poisoned that happy life by tasting of the forbidden tree, he needed, as a remedy, not without bitterness, to exercise the obedience of fear towards God, the righteous Judge, and then the obedience of faith in God and Christ, the merciful Physician and Savior, in order at length to be able as his spiritual health returns, to feed again on that sweet and immortal food,—the obedience of love. And thus it is on obedience that the spiritual life of a man and a Christian depends; and therefore does the Apostle call Christians “obedient children” (In the Slavonic text stands: children of obedience.). If any should find the thought of feeding and living on obedience, a far-fetched and exaggerated image, and not a conception of the mind drawn from the substance of the object: let such a one remember the utterance of the infallible Master, in Whose words it is impossible to suppose exaggeration: “I am the vine, ye are the branches: he that abideth in Me, and I in him, the same bringeth forth much fruit: for without Me ye can do nothing” (John 15:5). How is it to be achieved, that man should abide in Christ, and Christ in man, that man should be one with Christ, as the branch with the vine? This cannot be done otherwise than through the obedience of faith, by the free surrender of the heart and the silent submission of the will of man unto the all-pervading will of Christ. Thus does the obedience of faith really infuse into man the power and life of Christ, wherefore also the works of such a man are often far above and more powerful than the ordinary works of man. He who understands not or seeks an excuse, may say: How is it possible to live on obedience, that is, to be constantly employed in the fulfillment of the divine will? Is it then possible entirely to suppress one’s own will, which naturally exists, and which it is impossible to annul? And is it possible to know at every moment the will of God? Happy are the elect ones unto whom God sent His messengers; but, even to the elect these occasions were rare. He who speaks thus, proves, not that perfect obedience is difficult of accomplishment; but that he who does not exercise himself in work knows not how to perform it. If thou sincerely desirest to know the will of God, there exists also for thee an angel, who is both near and ready. This is thy conscience. Hearken to thy conscience, drown not its still small voice by the tumults of thy passions, and the will of God shall be revealed unto thee, and thou shalt be in the path of obedience. There is a still more impressive and perfect proclamation of the divine will, which thou mayest read in the holy Scriptures, hear at church, behold in the examples of saints. Hearken unto it, and the divine will shall be made clear unto thee, and obedience shall become more easy and sure. Everything throughout the world is ruled by divine Providence, and consequently by the will of God in so far as it is not produced by the will of man. And therefore in everything that happens to thee, thou mayest see the will of God. There comes prosperity, and announces the divine will, that thou must thank God. There comes adversity, and proclaims unto thee the will of God, that thou shouldst endure. For obedience may be manifested not only in doing the will of God, but also in abstaining from acting against the divine will, and above all, in suffering unmurmuringly according to the will of God. Learn to say meekly unto the messenger of the heavenly will, “Be it unto me according to thy word.” But learn also, at the sight of the cross, bravely to say, “Not my will, but Thine be done” (Luke 22:42), O my heavenly Father! Howbeit, although truth and virtue are accessible to all, it is yet not superfluous, but often indispensable to have special teachers, according to the kind of knowledge; special tutors, according to the kind of work. And thus also to progress in spiritual obedience as far as thou canst, as far as thou inwardly feelest an especial want, choose for thyself a special teacher, learned and experienced in that science, consecrated to that work, whose word should be made powerful by his life, enlightened through prayer, preserved from error by humility. Subject thy will unto his for the sake of God, and the will of the God of heaven will come down upon thee on earth, and thy simple earthly obedience will come up to heaven, according to the words of Him Who is the Giver of pastors and teachers, addressed to the true and lawful teachers, “He that heareth you heareth Me” (Luke 10:16). It is true that obedience unto God in the person of a man, has from olden times carried its schools far away from society, separated them from the community of the world, built for itself habitations, wherein it brought and still brings forth its fruits unto heaven and earth. But shall a lore which is, I confess, better taught in the silence of solitude, be therefore counted utterly unnecessary and useless for cities? The sons of this world desire more and more extent for the exercise of their own will. And whither does this lead? Leads it not to what was once foretold by the prophet: “And it shall be, as with the people, so with the priest; as with the servant, so with his master; as with the maid, so with her mistress; as with the buyer, so with the seller; as with the lender, so with the borrower; as with the taker of usury, so with the giver of usury to him” (Isa. 24:2)? But what shall happen at the time of this unlimited freedom of the will of man? The prophet says: “Behold, the Lord maketh the earth empty, and makes it waste” (Isa. 24:1). That is, He will suffer willfulness to punish itself by the very disorders which it brings forth. And after all temporal punishment, do you know what shall add fuel to the fire of hell? Nothing more than self-will with its offspring, which is sin. Put aside self-will and hell will find no fuel in you. Accept the will of God and you shall receive heaven in your hearts, until it receive you into itself. For wheresoever abides the will of God there is heaven. But is it an easy thing to part with liberty, which is natural to man? And who requires of thee that thou shouldst part with liberty? God has bestowed liberty upon thee, that thou mightest freely choose between good and evil, between the creature and the Creator, between thyself and God. If thou choosest thyself, the creature, the evil, thou shalt be led unto captivity by self-love, by the creature and by evil. If thou choosest and constantly abidest in the choice of that which is good, of God and His will, thou wilt not lose, but on the contrary strengthen and increase thy liberty. “Where the Spirit of the Lord is, there is liberty” (II Cor. 3:17). But is it easy sometimes to break down self-will? It is sometimes difficult indeed, and sometimes it is easy, in proportion as thou makest it difficult or easy to thyself. When thou wishest to fulfill the will of a beloved father or mother, is it not then easy for thee to forget thine own will, is it not even pleasant to sacrifice it? Who hinders thee from becoming through faith and love the son of God, and who prevents thee from rendering thy obedience to the will of thy heavenly Father sweet unto thee? Our Father, which art in heaven! Thy will be done in all of us! Amen. From: Joseph Masters, Trans., Philaret, Select Sermons (London: Elibron Classics, 1873).